The UPLIFT Desk Short Crossbar End allows you to install your UPLIFT standing desk base to compact desktops, freeing up room underneath for a keyboard tray and other accessories. The short crossbar end fits desktops as narrow as 26" wide, providing an ergonomic space-saving solution for desks everywhere. If you're just looking for the standard length pieces, you can visit the UPLIFT Desk Standard Crossbar End listing. Why do I need Short Crossbar Ends? Short Crossbar Ends allow you to mount your narrow desktop to an UPLIFT Desk frame. 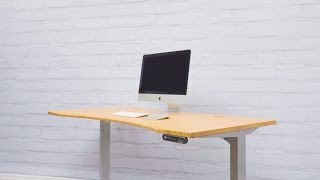 If your desktop is smaller than 26 inches wide, this is a crucial tool to help you build the ergonomic desk you've always wanted. Will this fit on my UPLIFT Desk? Yes, UPLIFT Desk Short Crossbar Ends were designed to fit on all UPLIFT Desk models. Yes, Short Crossbar Ends are available in your choice of black, white, and gray powder-coated finishes.